Join the trend of switching to electric tankless and start saving today! See an internal view of the Stiebel Eltron tankless water heater - learn how it works and what makes it superior to the competition. Limited Quantity of Factory Refurbished units available. The new Tempra 20 Trend replaces the discontinued Tempra 20B. It offers all the same features of the Tempra 20B, with a new digital display, in a modern white powder-coated case. 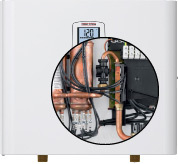 The Stiebel Eltron Tempra 20 Trend, with a maximum power output of 19.2 KW, is designed for whole house applications in regions where the incoming water temperature is above 60°, and is therefore suitable as a whole house water heater in the southern U.S. and in some warmer northern climates. It is also a popular choice for summer use vacation properties in northern climates where the electrical service does not permit the installation of a larger model. Furthermore, it is frequently used as a point-of-use heater where more demanding flow rates are required. 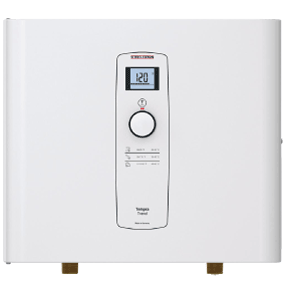 Like all Tempra Series tankless water heaters, the Tempra 20 features true microprocessor-controlled temperature regulation and dial selector which allows you to set the desired output water temperature at any level between 86 and 140F (30 and 60C). It is one of the only tankless water heaters on the market that features a true thermostatic temperature control and full power-modulation based on both the incoming water temperature and the water flow rate. The Tempra 20 Trend will automatically adjust its power output to accommodate changes in the incoming water temperature and flow rate so it can precisely maintain the desired output temperature. The result is the most precise temperature control of any tankless water heater on the market today! The trend towards increased energy efficiency is here to stay with the Tempra 20. Join the Tempra trend today. * This chart is based on 240v input. for temp rise data at 208v input. If your water hardness trends above 7 grains per gallon (GPG) or 120 mg/l (ppm), you should consider hard water treatment prior to your tankless water heater. If your hardness exceeds 12 GPG or 200 mg/l (ppm), hard water treatment is strongly recommended. Hard water treatment helps maintain performance and efficiency, ensures optimal water flow and pressure, and protects your heater from pre-mature failure due to mineral build-up inside the heating module and other components. Thermostatically Controlled? Yes, temperature control with full power modulation based on flow rate and incoming water temperature. Please note: A minimum 125 AMP household electrical service is highly recommended and will likely be required to install this model. If you are unsure of your electrical capacity in your home, please consult your electrician or contact us for assistance before ordering. We love our Stiebel Tempra 20. Have paired it with a Hague water softener and are very pleased with the result. I got it very fast and we replaced our old one of many years, It works great, no problems. All Stiebel Eltron Tempra and Tempra Plus tankless water heaters are ETL Listed in the USA and Canada, ensuring they conform to all applicable safety standards. All Stiebel Eltron Tankless Water Heaters are tested and certified by WQA against NSF/ANSI 372 for "lead free" compliance.